Inventory We are a resale marketplace, not a box office or venue. Ticket prices may exceed face value. This site is not owned by Paramount Theatre Denver . The Paramount Theatre Denver was added to the National Register of Historic Places in 1980 nearly 50 years after its opening. The venue houses one of two Wurlitzer theatre organs left in the United States. 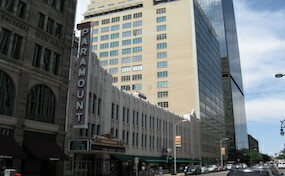 The Paramount Theatre box office is located at 1621 Glenarm Place in downtown Denver, CO. The seating capacity is 1,870. The Paramount Theater is primarily used for traveling concerts, comedians, and smaller more intimate family shows. Theatre-Denver.com is not affiliated with any primary box office, venue, or supplier. We are independently owned and operated. Prices may fluctuate below or above face value and will change with the market. To purchase tickets for any Paramount Theatre Denver events simply pick up your phone and call our operators at anytime or follow the easy to navigate steps online to choose the event of interest.